Archtops: F-50, F-55, F-65: GT-70, GT-75, GT-75-12. Flat tops: 00-18E, D-18E, D-28E. Between 1959 and 1965, CF Martin produced a range of flat-top roundhole and archtop guitars, each fitted with one or two DeArmond Model 2000 pickups with one cosmetic difference. These pickups each have an irregularly-shaped ope in the top, as seen below. This particular variation on the standard 2000 pickup is unique to CF Martin, except for one Guild archtop. See the Guild section for information. 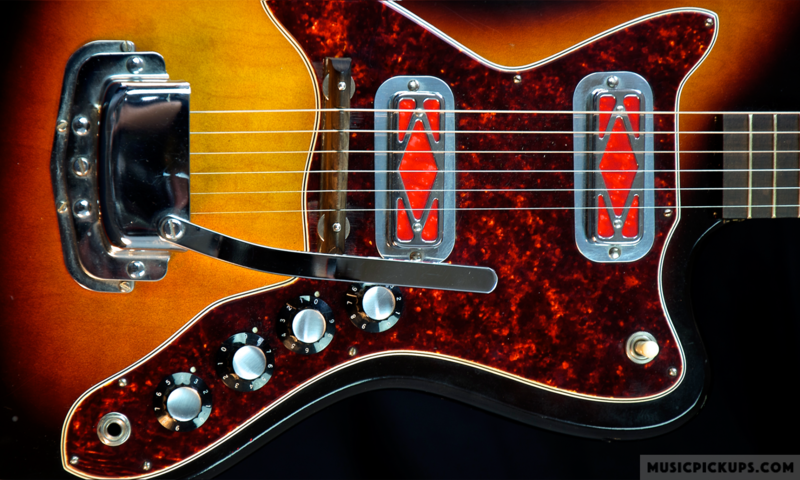 This pickup – a variation on the Model 2000, in two different heights, for Bridge and Neck – was fitted to the F-50, F-55, F-65, GT-70, GT-75-12 and GT-75R series of archtops, finished in chrome with black coil formers. This pickup was fitted to the 00-18E and the D-18E flat-tops at the neck in chrome, and the D-28E flat-top in gold, with black coil formers. Two versions of this pickup were also produced – one with a symmetrical outer fixing plate and one with a rebated plate for locating at the neck. Most of the flat-tops had the bridge pickup installed away from the sound-hole as shown here. A unique aspect of all of these guitars is that they were factory-fitted with parametric tone controls. The complete wiring harness, including pickups, switches and pots, was assembled by H. N. Rowe-DeArmond, as was common at the time. This tone control arrangement was not provided for any other customer of H. N. Rowe-DeArmond. This same tone control was fitted in DeArmond’s Model 610 Volume/Tone control foot pedal. A basic tone control comprises a single-gang potentiometer and a capacitor. CF Martin D-18E. This instrument has three controls – two volume and one tone. Otherwise it is the same as the D28-E above. prod. 1959. CF Martin F-50 archtop with original transparent perspex bridge. Prod. 1962-1965.